Anaheim, CA – March 26, 2019– Anaheim Elementary School District has been honored with the Best Communities for Music Education designation from The NAMM Foundation for its outstanding commitment to music education. Now in its 20th year, the Best Communities for Music Education designation is awarded to districts that demonstrate outstanding achievement in efforts to provide music access and education to all students. To qualify for the Best Communities designation, AESD answered detailed questions about funding, music class participation, instruction time, facilities, and support for the music programs. Responses were verified with school officials and reviewed by The Music Research Institute at the University of Kansas. ANAHEIM— After more than 20 years, all 23 Anaheim Elementary School District schools will now be on a traditional single-track calendar. This change has been well received by families at the three remaining AESD schools that are still on a multi-track calendar. 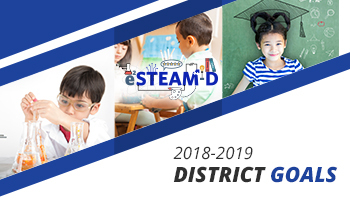 At the January 30, 2019 Board meeting, the Board unanimously approved Thomas Edison, Horace Mann and Ponderosa Elementary Schools to join the other 20 AESD schools that operate on a single-track calendar and voiced their confidence that this was in the best interest of the students and their families. On Monday, January 21, 2019 AESD students throughout Anaheim volunteered in various ways to improve their community and spread kindness. Click ‘Read More’ for photo gallery. Our enrollment Festival is a great opportunity to get help enrolling your child, learn about our academic programs and meet AESD staff. No RSVP is necessary to attend.